Tis the season to be jolly and giving. This Christmas, it's no difference for me. I baked some goodies to give away to my family members. I hope they like it. 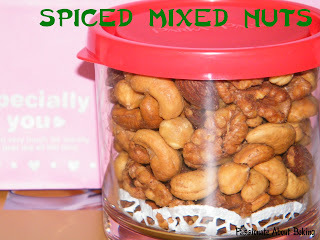 Spiced mixed nuts which include cashews, almonds, walnuts and some hazelnuts. I used the guide based on the Straits Times' Mind Your Body dated 17 Dec 09. 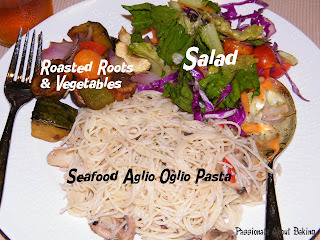 I used olive oil, together with dried rosemary and coat them with mixed spices to toast. 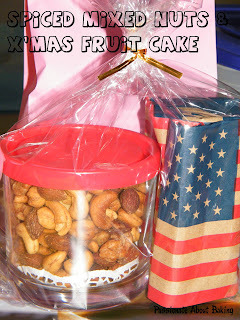 This include spiced mixed nuts and my X'mas fruit cake. 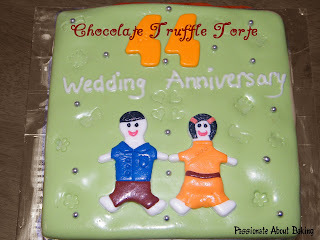 Finally, I made a Chocolate Truffle Cake and covered it with fondant to celebrate my parents' in laws' 44th wedding anniversary on Christmas Day. Overall, the cake, the frosting wasn't quite well done. However, my parents in law were happy as they understood it did take quite some time to make this cake. :p I'm fortunate that my parents in law are not fussy people! The last workshop I attended was just a month ago. My dear friend, Doris, "jio" (means gather) a few of us to attend another workshop with LA again. I just couldn't reject. Mainly because I like LA's workshop, and also because Doris has attended many workshops and has attained a certain level of complexity in workshops. I know she won't go for anything lesser. So if she wanted to learn, that would mean it will be of certain standard and method. She asked if I would be interested in Passionfruit meringue cakes. Gee... of course I would be. So finally, the date was settled for X'mas morning since that will be the time when our instructor LA will be available. 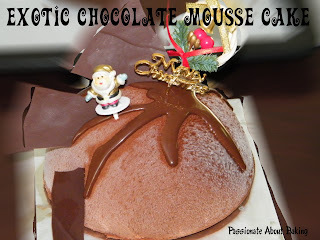 That morning, we were taught two cakes-Passion Meringue Cake and an Exotic Chocolate Mousse cake (similar to Pierre Hermes). There were just many many steps to go through to prepare just two cakes. 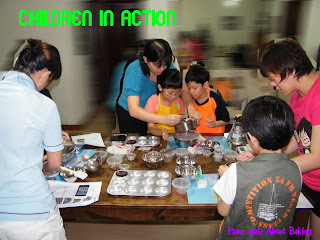 Similar to our previous chocolate workshop, it was rather tedious, but the result? Fantastic outcome! 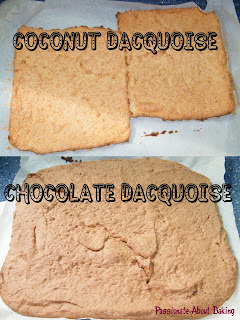 Preparation of Dacquoise for two different cakes. Coconut Dacquoise for Passion Meringue Cake and Chocolate Dacuoise for Exotic Chocolate Mousse Cake. 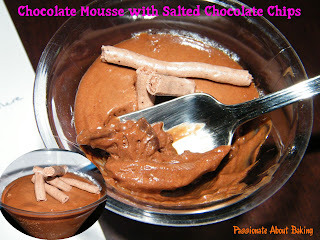 LA prepared some extra chocolate mousse with salted choc chips (topped with chocolate meringue sticks) for us to try. It was...HEAVENLY! 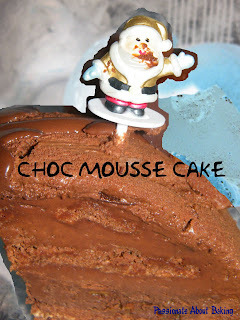 LA showed us how to cover the mousse cake by spraying chocolate on it. I've always enjoyed LA's workshops as she always has interesting stuff to show us. Each workshop, I learn different methods and combinations! 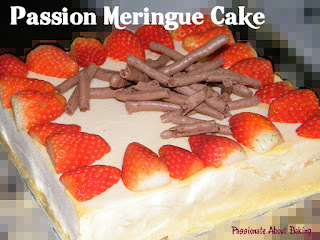 Finally, the presentation of the Passion Meringue Cake decorated with fresh strawberries and chocolate meringue logs. And this was the Exotic Chocolate Mousse Cake which has the salted caramel chips. Very interesting taste. Each of us get to bring back a quarter of the cake. Each slice is about what you would get outside for about $6-7 each. It's really worth the learning process. 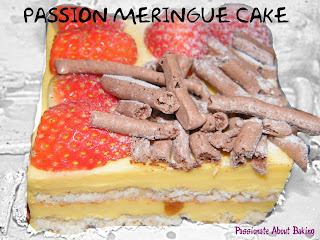 I can't wait to try the Passion Meringue Cake as I'm a big fan of passionfruit! 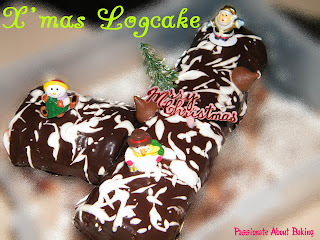 Wish all blogger friends, readers and visitors to my site a MERRY CHRISTMAS and a Happy New 2010! May the new year brings in new hopes and new dreams! For the longest time, I've been wanting to make more vanilla extracts. Mainly because I don't want to waste the vanilla pods that I still have. But at the same time, I can't find a suitable bottle to make the extract. I still have the vanilla extract I made the previous time. 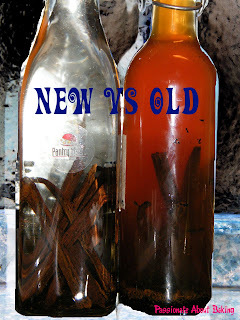 Ever since I started using my own vanilla extract, I just can't use vanilla essence anymore! Since the last time I made the extract, I had constantly added more vodka and even vanilla beans into it when the volume grew lesser and lesser. Finally, I found my bottle. Time to make my second bottle of vanilla extract. I got very excited when I made my second bottle. I can dream my dream away that I'll have endless supply of my vanilla extract. Isn't that wonderful? 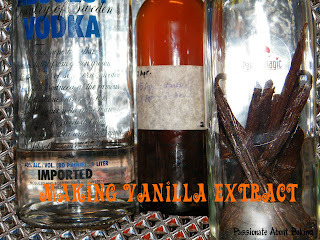 These were the ingredients that went into my vanilla extract - 6 Madagascar Vanilla pods + Absolut Vodka. Plus two months of "standing" and "shaking". I packed a small bottle for a dear friend, who has taught me a lot, and shared her baking experience with me unreservely. Thanks dear D! It is really a pleasure to know you! The day before a workshop, there tend to be quite a lot of preparations to be done. Fortunately, I happened to have quite a lot of leave to clear this December. 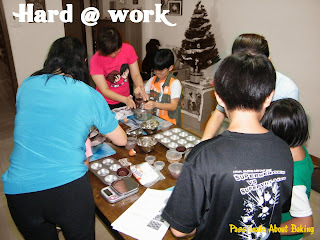 I can't imagine if I hadn't been on leave on Friday, then I'll be preparing the items like crazy on Friday evening. 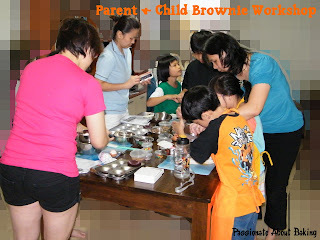 I baked some brownies for the participants to try, prepared all the ingredients, equipment before the actual day. There were a total of five children even though three were allowed. :p Well, since it was rather informal, and the "extra" children didn't get another set on their own, I guess it was alright with me. Can't bear to turn the child away, can I? Pondering. Wondering. Thinking. Asking. Questioning. What will be the 3rd birthday cake to make? Well, it's either the best, or the worst. Unfortunately, it was the latter. I was a bit ambitious, wanting to make a fondant cake for the children. With last minute preparation for the goodies, that left me with little, or no time to do the figurines for fondant. 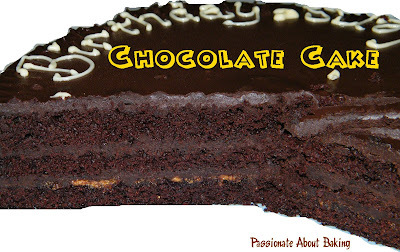 With time not on my side, I can only settle for the easiest cake and design-Chocolate and chocolate ganache. Thanks to Youfei again. We had been on Gmail Chat once a while. Just happened that when I needed some help, I found her there! Heehee... I've been seeking her advice and suggestions. 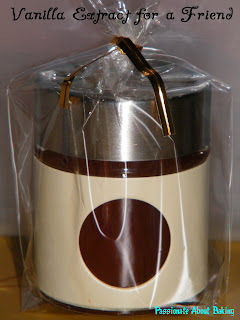 Fortunately, she provided very useful inputs for me, so that I can complete my 2-tier chocolate cake in time. A cake big enough to feed approximately 30 people at LTS childcare centre. 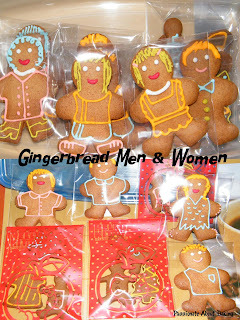 I had spend most of my time preparing their goodies. 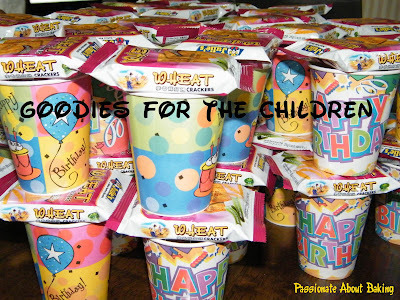 Instead of the usual plastic bags with party poppers and sweets, I made my own goodies and bought party cups instead. 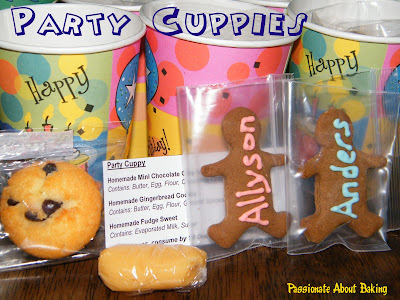 What's in my party cuppies? 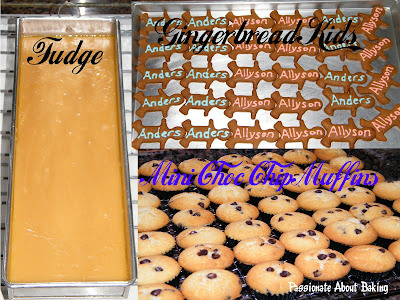 It's fudge sweet, mini chocolate chips muffin and gingerbread cookie with either of my kid's names. I also included an ingredient list in case some kids might be allegic to some kind of food, perhaps? I topped the cuppies with Julie's Wheat Biscuits, hopefully to encourage the children to eat more healthy food. Saturday celebration was with LTS' maternal grandparents. Sunday was with their paternal grandparents and cousins. I didn't want to duplicate the same cake even though the "guests" were different. I was getting rather "tired" of making the same cake in two days. So I decided to try a new recipe from a library book I just borrowed - Cake Temptations and other desserts. 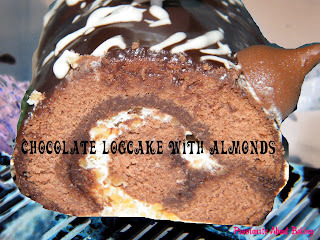 I found that the recipes seemed to be rather easy to follow, and looks really good. I was pleasantly pleased when my father-in-law went for a second helping of the coconut cake. Personally, I like it very much too! [One more cake to go!] Pardon my terrible frostings! Fortunately my children and my in-laws are not so fussy about the designs! 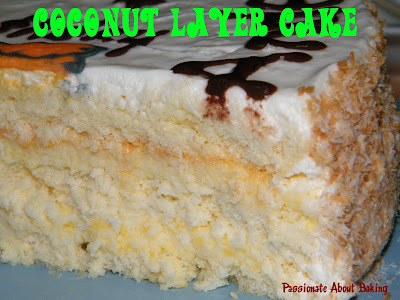 Recipe for Coconut Layer Cake, extracted from Cake Temptations and other desserts with my modification. 1. Grease a 9" round cake pan and set aside. Preheat oven to 150C. 2. Whisk egg whites till foamy, add sugar gradually and beat until stiff. 3. 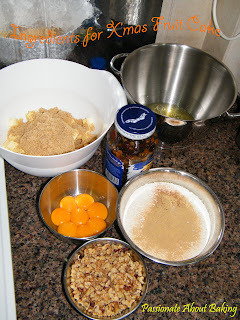 Add egg yolks one by one and mix thoroughly. 4. Add in the flour and mix till combined. 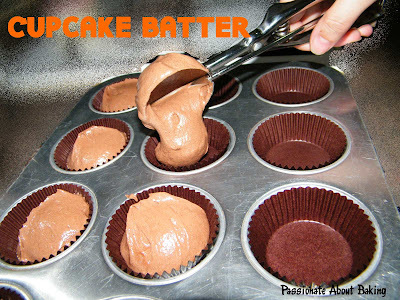 The batter should be rather stiff. 5. 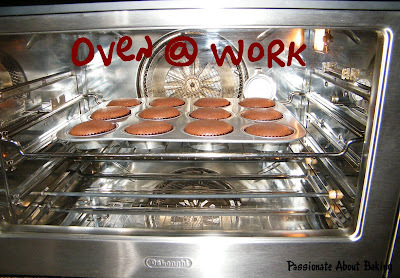 Pour the batter into the prepared tin and bake in the preheated oven for 40mins. 7. To make coconut filling, mix cornflour, milk and egg yolks in a pot. Add in sugar and cook till thick. 8. Stir in salt, vanilla extract, butter and coconut. 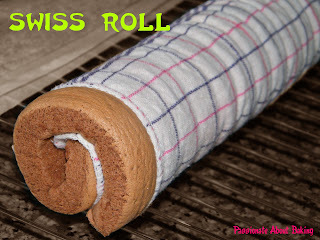 Remove from teh stove and set aside to cool. 9. 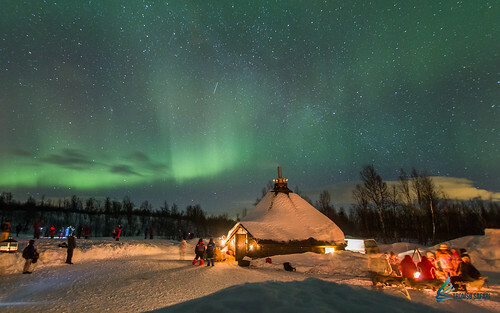 To make sugar syrup, put 15g sugar and 15g water to a small pot over small fire. Stir till the sugar dissolved, off the fire and set aside. 10. Fold in the 100g whipped cream. 1. 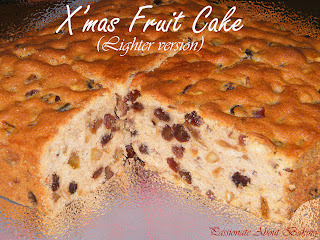 Cut the cake into 3 layers and moisten each layer with light sugar syrup. 2. 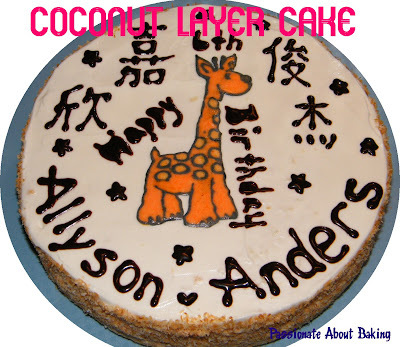 Place one cake layer onto the cakeboard and place coconut filling on top. 3. Cover with the second cake layer and repeat. 4. For the final cake layer, frost the whole cake with the remaining 220g whipped cream. 5. 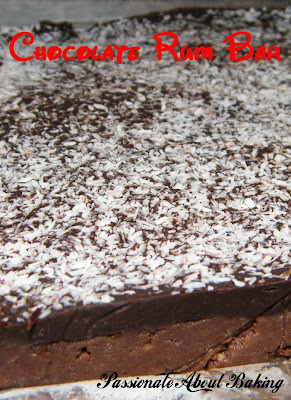 Coat the sides with toasted desiccated coconut. 6. Design the top as you wish. I hope you'll all love this cake as much as I do! 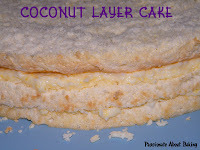 I've never tried a coconut cake before, neither a cake that is as light as this! This is definitely keeper for me! December is my favourite month of year. It is a month full of celebrations. All my children are born in the month of December. The eldest on 6th, and my Little Twin Stars (LTS) on 16th, and not forgetting Christmas too! I guess being twins, and being in childcare centre benefited them. They are able to have a celebration in the childcare centre, unlike my eldest, who had the privilege of being taken care of by his grandparents. So on Saturday, I baked a Moist Chocolate Cake for LTS for their celebration with their maternal grandparents. I was at a loss of what to bake for them. I wanted to do three different cakes, but didn't know what to start with and how. 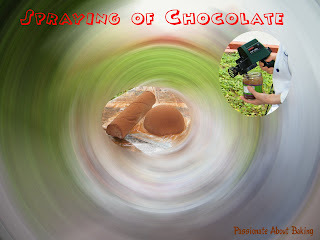 Fortunately, Youfei suggested making a chocolate transfers. I did just that! 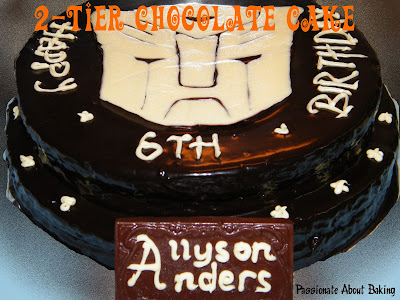 I made a white chocolate autobot, freeze it and transferred it against the background of the chocolate ganache. It did stand out. 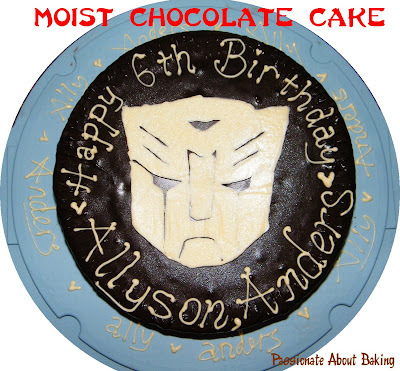 My son finished up the whole autobot chocolate, but didn't even try the cake! This was only cake #1 in line. Two more cakes to go! How fortunate they are. My younger sister brought her sons over to my place yesterday for a swim. Her spouse was on reservist. I was on half day leave. She is a homemaker. Therefore, both of us were and decided to meet up. We haven't meet up for a few weeks as she had gone for a holiday in Taiwan. While she brought her children and my son to the swimming pool, I quickly whipped up two dozens of chocolate cupcakes. She has been a great fan of my chocolate cupcakes, in particular, this recipe only. :p That explained why she only wanted cupcakes for her birthday earlier this year. Anyway, after dinner, I gave them the cupcakes plain. I had prepared some buttercream as she really likes the cupcakes with my buttercream. After some hesitation, she decided not to frost the cupcakes, and to eat it plain. 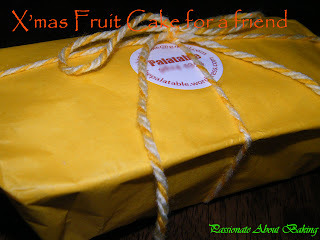 One fine day, I received an email from a lady, recommended by another friend, who wanted to order a cake for her spouse. 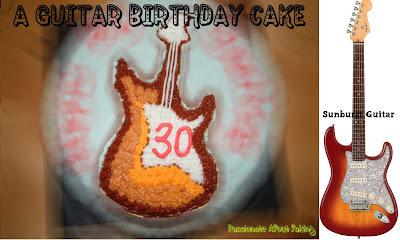 She told me her spouse loves guitar and asked if I could do a "Sunburst" guitar shape cake. I was like "Sunburst"?? Gee, I've never been musically inclined, nor do I know anything about musical instruments. The only muscial instrument I played was recorder in my primary school. And the sound that came out from me just went "pee pee pee pee". So I've decided playing musical instrument is not my forte. Back to the cake order. So finally, she was kind enough to send me a picture of the Sunburst guitar. We discussed how she wanted the picture to be, the wordings and the colour. Thanks to her suggestion, I made the "body" bigger instead of having it in proportion. It was a chocolate cake with strawberry jam and whipped cream. I was glad the couple liked the cake. 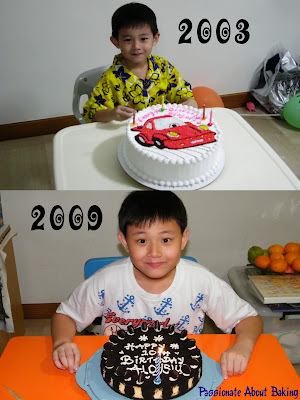 In order to protect their privacy, I have masked out the wordings written on the cake. I found a recipe on friands and tried it yesterday. After baking, then I found the recipe to be so similar to financiers. 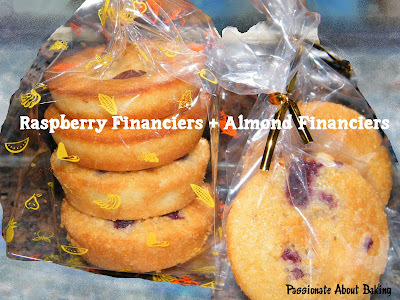 Did a check on these two-financiers and friands and found that they are actually the same. 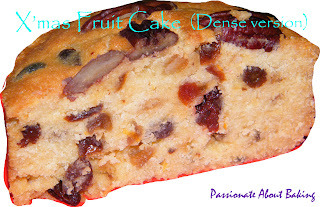 The friands that have become popular in Australia and New Zealand appear to have been based on the French financier; however, Australian and New Zealand friands typically have additional flavorings such as coconut, chocolate, fruit, and nuts." ~ Extracted from Wikipedia. 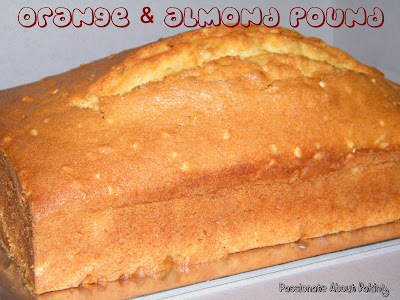 I baked an Orange & Almond Pound cake for a colleague who is recuperating at home from cancer. It was really a heart pain to see her like that. Even though we were not very close all this time, my heart went out to her the moment I heard about her case. I was really sad, and I sms her once a while to cheer her up, and give her all the encouragement that I can. I finally found the courage to ask if I can visit her. Even though she looked differently, she is still as pretty as ever. I made an excuse to bake for her, so that I can visit her. She was happy that I visited her, and liked my cake very much. I tell myself, if I have the time again, I will bake for her again, at least to keep her going and make her happy. 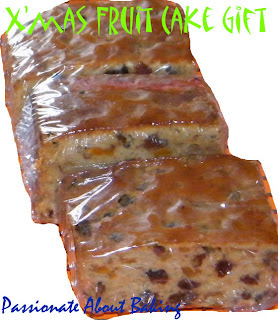 This pound cake will be taught for under my Perfect Pound workshop. Sign up for it now! My eldest son has just turned a perfect 10! I had decided to have a simple celebration at home with my in-laws. Come to think of it, it has been a memorable 10 years for us. He was the first grandson in both my family and my in-laws. When he was a baby & toddler, he was under my parents care. My parents doted very much on him. My dad will buy some expensive stuff for him to play, while my mum will buy some expensive fish, brown rice and other foods for him. So he is quite pampered. He has since grown from a very adorable boy, to a little pump cutie. It wasn't easy when he started going to school. He belongs to the kind that needs "pecking", nagging, canning and scolding before he will study. Initially, I will teach him during examinations or tests, after his P3, I sort of gave up. I let my spouse take over that role. I'm just too impatient to coach him anymore. Coincidentally, after the birth of my eldest boy, my third sister bought an optical fibre christmas tree for me. Since then, I've been keeping it with me and bringing it out every Christmas. It's no exception this year. We took out the christmas tree as part of the celebration. The christmas tree with its optical fibre lights is easy to assemble and dis-assemble. 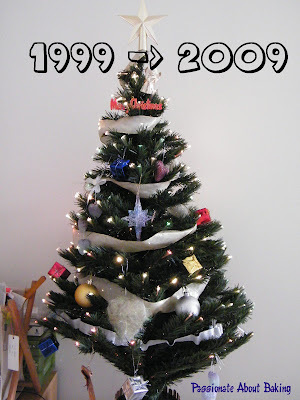 It's so durable to own such a christmas tree! 1. 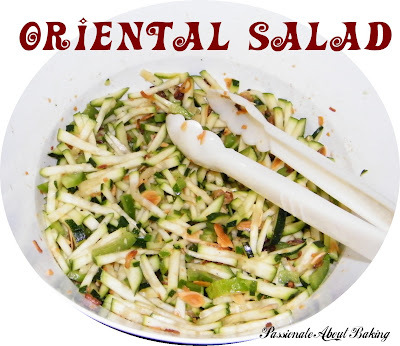 Appetiser 1 : Oriental Salad. 2. 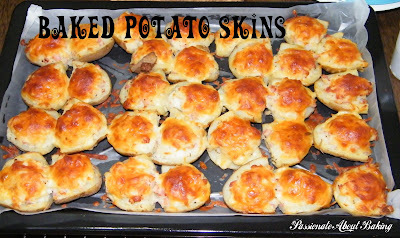 Appetiser 2 : Baked Potatoes. The inspiration was from Elinluv's Tidbits Corner. I simplify the ingredients. 3. 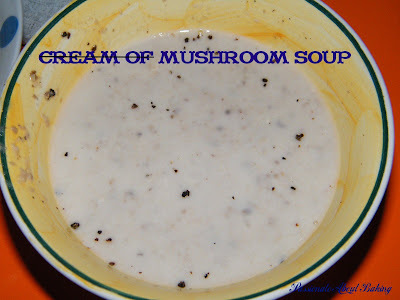 Appetiser 3 : Mushroom soup. The soup was very diluted as I didn't add starch to it. 4. 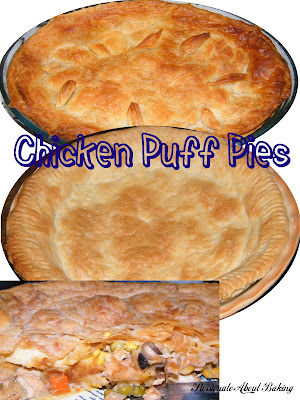 Main : Chicken Puff Pies. Chicken pies of all sizes. I made two big, and six individual share to feed nine adults and six children. Of course there were some left overs. 6. 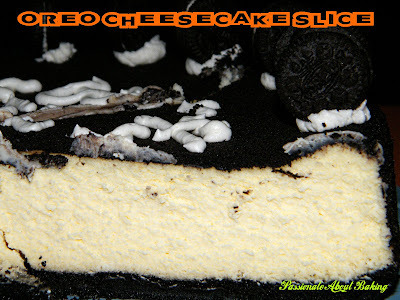 Dessert 2 : Birthday cake as requested by the birthday boy - Oreo Cheesecake. 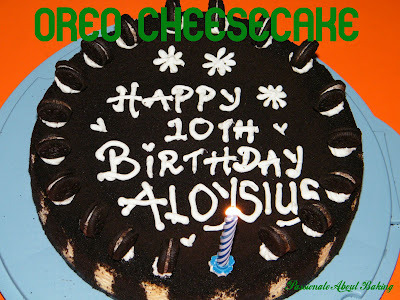 I bought mini oreos to decorate the cake. But guess what, there was one mini oreo short!!! Goodness! I wanted to scream out "HELP!" 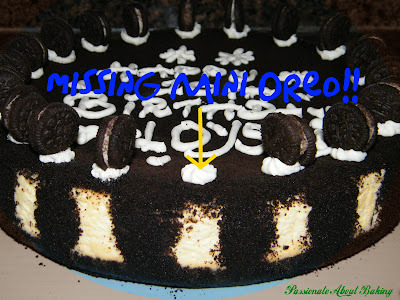 However, when it comes to singing the birthday song, I managed to put the candle on the "flower" of the missing oreo place! *whew! * Close shave! At the end of the evening, my sister-in-laws managed to packet some of the leftover goodies home. I'm glad they enjoyed the food. I had spent hours preparing them with the help of my domestic helper. Even though I was really tired from the preparation, I think it was really worth the effort!